came in just as pictured, nice fabric! The Madison Park Brianna 7-piece Comforter Set is the perfect update to bring beauty and grace to your bedroom. An over-scaled printed floral motif, in blush and white hues, adds a soft accent to the grey cotton sateen comforter. The solid grey reverse provides rich touch of color to complement the top of the bed. Coordinating shams with a floral motif pair beautifully with the comforter, while three decorative pillows with embroidered details and fabric manipulation complete the ensemble. For a clean finish, a solid grey bed skirt with a 15-inch drop is also included in the bedding set. Machine washable, this cotton sateen comforter refreshes your space with its casual elegance and charming allure. The set looks as pictured it hangs over the side of a 14 inch mattress so the fit is OK. However the material is cheaply made and the stitching that hold the comforter padding in place probably won’t last for many washes. It’s not a soft material, I don’t like the feel. If I saw this in the store before I bought this online I would not have bought it. The bedskirt is very thin and slides as you’re trying to put the mattress on top of it. Its a nylon type of feel. Be careful when assembling the bed, if the Mattress is heavy it might tear the bedskirt if its pulls when lying the mattress on top of it. The decorarive pillows are nice. Pictures do not do this comforter justice. It is absolutely gorgeous in our grey bedroom with antique white furniture. The size is just right for a King mattress of 15 inch depth. The quality is great and it looks like it cost far more than what we paid. Thank you Overstock! We are very pleased with this purchase. Very soft and comfortable. Kids dove in immediately. All the pieces worked well together. 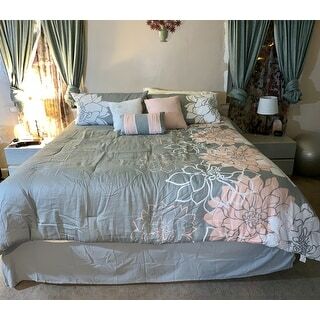 Wish comforter was a couple inches wider but great deal. Super cute and very comfortable. I just received my comforter and its gorgeous! It fits my room decor and makes it more comfy. The colors are exact to the picture. My only wish is it would be nice to order extra pillow covers. It comes with two but I prefer 4. Beautiful Comforter Set! Well made with excellent materials. This was a birthday gift for my teenage daughter. She loves it! The grey color is very bright and pleasing to the eye. Well made and really cute decorative pillows. Ordered King size and wish it was just a little bit wider. I Bought two grey sets for my two toddler boys and it is true to size and color and it is soft and comfortable.! Shipping was fast ! The Only thing is that it makes a lot of noise when my boys move at night lol, other then that it is a great set ! Pretty set. But super short. Doesnt cover the bed entirely. Needs to be longer. Order a size up if you want full coverage. Very soft and feminine. Definitely a set for a female. Love the pillows that come with this set. They are very pretty and add that extra touch of glam to the set. I just wish it was longer on the sides. The quality and description were right on and I love my new comforter set! I haven't received it. The order was due to deliver 3/29. Shipping has continued to push since then. Overstock used Xpo logistics, and I can't reach anyone to get better information. I'm extremely disappointed. If my comforter doesn't show up by tomorrow, I'm cancelling the order. Good comforter. A little short on the sides and it's a little more girly than what I was expecting but it's still a good buy. Great set, great feel! Color is a bit more towards the peachish pink side. IT IS SO BEAUTIFUL...IT LOOKS BETTER IN PERSON!! Unfortunately no, matching curtains are not available. Perfect colors and the best price. "Does it come in yellow "
"What is the thread count on this comforter set?" The thread count is cotton sateen, printed,comforter ,8OZ/YD2 polyester filling ; Cotton polyester bedskirt and pillows. "What does sateen mean? Is the comforter shiny or does it have a matte finish? " This has a sheen to it not extremely shiny.